" I came to this race just to boost my morale"
-Mary Akor after winning the Vancouver Marathon over the weekend in 2:37:54. 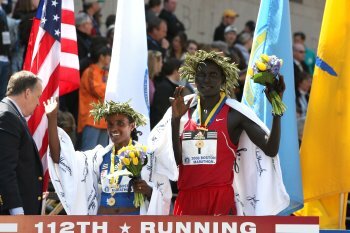 Akor's win was just 3 weeks after the women's Olympic Marathon Trials where she faded to run 2:39:34. Akor is most known for running marathons very frequently (20 between the 2004 and 2008 Olympic Marathon Trials). This year for the Trials she focused on the race, and didn't have the results she hoped for, so it was back to her frequent racing ways in Vancouver. LRC The Week That Was We do our best to try and break down the action from last week on and off the track. The professional track and field circuit got underway in Doha, Qatar with some stunning performances by Allyson Felix and David Oliver, but we were most impressed with Augustine Choge running the last 500m of the 3k with one shoe and still winning the final 4 way sprint. The big news on the domestic front was the Andrew Wheating and Boaz Lalang bandwagons really got rolling at the Oregon Twilight. 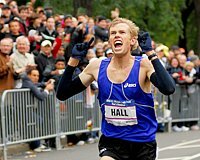 Wheating in 3 weeks has gone from unheard of to a contender for the NCAA 1500 crown and possibly an Olympic berth. Travis Padgett blasted a sub 10 100. On page 2 of our weekly recap, we take a loot at Brian Sell, Ritz, Paula, and a prominent coach leaving DI for DIII. Plus, our weekly drug news (but no pictures of heroin needles like last week), thread of the week, and some major props to a high school girl who won a state title in Texas by herself.